I made the Burda 101 dress up with the white Swiss dot that I picked up from Goldhawk road recently, I can’t remember the price, I think it was about £4.50 per metre. Initially I wasn’t too sure about which side to use, however I have since found out that the right side is the flat side not the bobbly side. That’s usually because Swiss dot tends to be more sheer than the one that I am using. I opted to use the bobbly side because on my fabric, when you use the flat side, you lose the effect of the bubbles. Plus, I really like the texture of the fabric. The bodice went together pretty easily. And surprisingly the Burda instructions weren’t all that bad! I think I was still a bit tired when I was finishing off the bodice on Sunday night as when I went to French seam the back, I made a 1.5cm seam instead of 0.5cm… But I just couldn’t be bothered to unpick it, and as I knew there was a bit of bagginess at the back, I chose to wing it… Rest assured though, I will not be doing the same to the other three dresses! 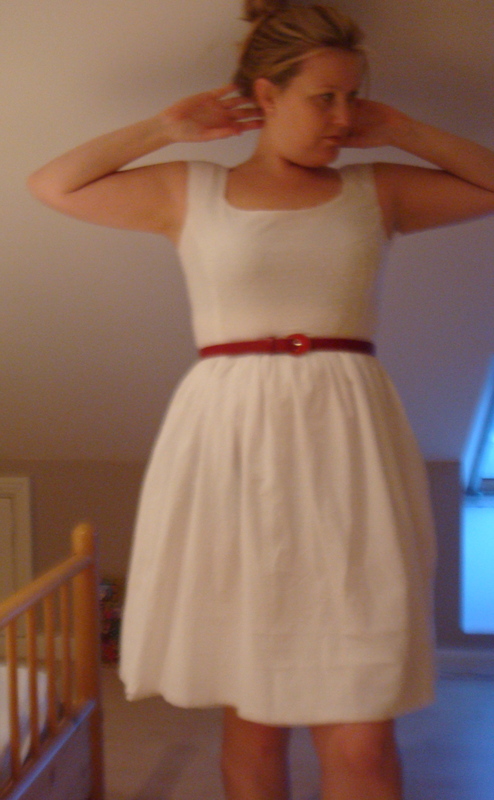 Here’s a quick peek of the dress, I still have to hem the bottom, but otherwise it is all finished though. And despite that error with the french seam, the dress fits perfectly! I’m very happy with it. I will get some better photos done at the weekend and put them up here and on the flickr group. Yeah! A dress is finished! Love it, especially with the red belt. Can’t see the swiss dot farbic very well in pic, but I’m sure it’s lovely. Congratulations on your first June Challenge Dress! Thank you! I know, the light was terrible when I took the picture last night! I’ll definitely take some better pictures this weekend. That looks good. I like the red belt with it. Looking forward to more photos soon!